To provide vestments and paraments to missions, churches, and clergy by keeping alive the Medieval arts of ecclesiastical embroidery and vestment making. 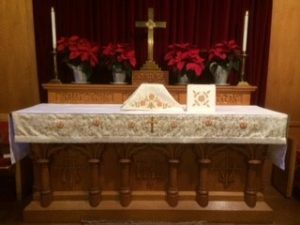 The Ecclesiastical Vestment and Embroidery Guild of the Diocese of New Jersey came into being in the 1950’s under the artistic hand of Mrs. Florence L. Fluckinger, a member of St. Paul’s Episcopal Church in Westfield. 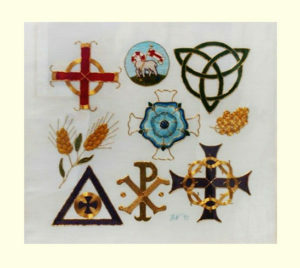 She shared her skill of ecclesiastical embroidery with women representing churches of several denominations. Florence taught classes twice a month which were open to any interested person. Novices were trained without fee, which remains the same today. Churches and clergy may place an order for their vestments and /or altar needs. Patrons pay only for the cost of supplies plus a small donation. Thus, for a substantial saving, churches and clergy can obtain beautiful handmade embroidery in the same tradition that dates back to Medieval time. There were plenty of Children’s embroidery designs as well. 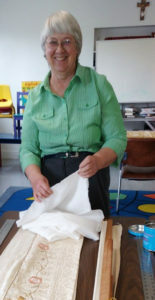 The trained guild volunteers sew, embroider or make repairs depending on the work to be done. Learn—there’s always more to learn. Beginners are more than welcome! Locations and time subject to change. Please confirm before attending. Recently completed a project? Share your creation with us! Send photo and description to Dcn. Karen Reeman. hgfhjghjghjghghjgjhgjhgjhg May 20, 2017 2017 ECW Annual Meeting /UTO Ingathering at Grace-St. Paul’s Church in Mercerville. Blessing of the ECW banner by Bishop Chip Stokes. 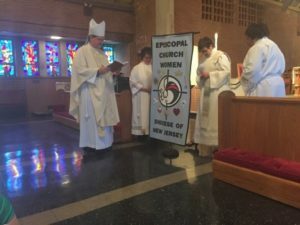 This light blue banner features the ECW symbol in liturgical colors surrounded by symbols of the 9 ECW districts with the words “Episcopal Church Women” (top) and “Diocese of New Jersey” (bottom). Made by Judi Buncher and Dcn. Karen Reeman (Monmouth EVE). 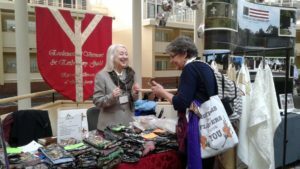 March 3-4, 2017 233rd Annual Convention of the Diocese of New Jersey at the Hyatt Regency in Princeton, NJ. The Ecclesiastical Vestment and Embroidery Guild table with their new EVE banner. Fashioned after a priest’s chasuble, this sumptuous red banner is lined with gold satin fabric and features gold orphrey. 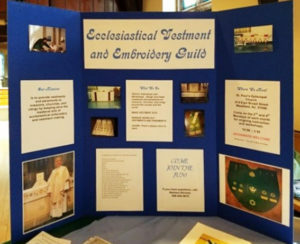 The words “Ecclesiastical Vestment and Embroidery Guild” and “Episcopal Diocese of New Jersey” are spelled out in ornate gold lettering couched in red. Made by Judi Buncher (Monmouth EVE). Christmas 2016 Grace Church in Plainfield. Remake of white chapel paraments including superfrontal, burse, veil, and bible markers. This exquisite set was originally made in the 1950’s by DoNJ EVE Guild members. Refurbishing required removing the hand embroidered cross and roses, applying this embroidery to new (more durable) synthetic fabric (the original silk had deteriorated) and re-embroidering the interconnecting metallic gold vines. Restoration by Barbara Nichols (DoNJ EVE). Advent 2016 (Nov-Dec 2016) All Saints’ Church in Lakewood. Fr. 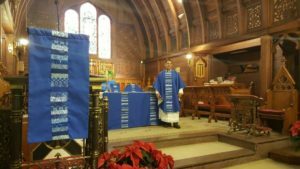 Juan Monge-Santiago celebrates a Eucharist wearing a contemporary chasuble and stole featuring strips of blue fabric in contrasting patterns artfully pieced. Part of a complete Advent sent including (besides the chasuble and stole) a full frontal, burse, veil, pulpit and lectern hangings. Made by Dorothy O’Neal and assisted by Janet Buonagura (Monmouth EVE).